Today I'm going to share with you my top 5 tips and tricks to help Miss T feel better when she's unwell. As a result of her long-term medical condition, she often gets coughs, colds and bugs so I need to have a lot of tricks up my sleeve to help. Thankfully we were sent a pack of #VicksTricks goodies from Vicks with some great suggestions too! Miss T has juvenile idiopathic arthritis or JIA for short. Whilst little is known about the exact causes of JIA (hence the 'idiopathic' part, meaning 'unknown') and sadly there is no cure, thankfully these days there is effective treatment available. What is known about arthritis is that it is an autoimmune system condition where the body's immune system attacks itself causing pain and inflammation and can result in long term joint damage. For Miss T who was diagnosed at age 2, the treatment has been weekly methotrexate injections (MTX) which work by suppressing the body's immune system and thereby reducing the pain of arthritis and preventing the long term damage that it causes. Whilst we are delighted that the treatment is working on her arthritis, one of the side-effects of a suppressed immune system is being prone to catching whatever bugs are going around - especially in these winter months! Here are some of the tips and tricks we've learnt along the way as well as some new ones thanks to Vicks. We've found that distraction by watching a favourite TV programme or DVD helps Miss T relax and not think about feeling poorly. Distraction methods have also been key when it comes to focussing her attention away from the pain of the weekly Methotrexate injection. A healthy dose of distraction with toys, games or bubbles works wonders at the hospital when she is having her regular blood tests used to monitor liver function (Liver damage can be another side effect of MTX if not closely monitored). Thanks to a set of four fun #VicksTricks Magic videos, we now have some new distraction tools to use! Those familiar with CBBC's "Help! My Supply Teacher is Magic" will recognise magician Katherine Mills who we think is just awesome. Here's one of the videos which we put to the test ourselves after watching it. 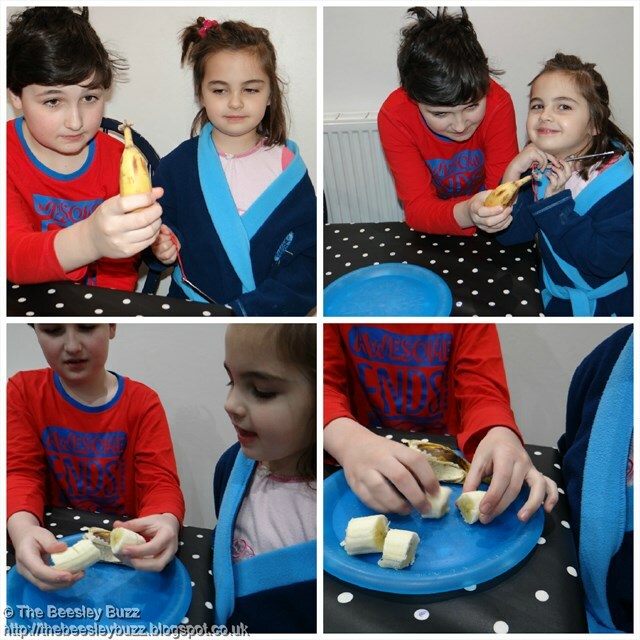 Of course, using a banana gives extra encouragement for kids to eat healthily too. Especially as they start to regain their appetite after feeling unwell. 10 year old D who loves magic, wowed Miss T with the banana trick! We also LOVED the the jumping coin in the bag trick - so simple but really effective! According to research by Vicks 'over half (52%) of parents said that rest was the most important thing for making children feel better' and I have to say that I agree. Sleep and rest is our bodies' way of healing and recovering so getting a good night's sleep and resting throughout the day when unwell is really important to us. Better bend than break as they say. This flexibility relates to YOUR schedule too, not just your child. Whenever Miss T is unwell, I brace myself for disturbed nights, I clear my diary so that I'm not stressed by other commitments and I make a decision to leave the housework and any chores that can be left until she's feeling better again. Whilst the word comfort conjures up images of snuggling up with a duvet, warm soup and being looked after and cared for, it turns out that the word 'comfort' actually comes from the latin word 'comfortare' which means 'strengthen greatly'. Finding this out actually spoke volumes to me because it made me realise that we're not just soothing our children when they are unwell but helping to strengthen them and help them get better by comforting them. helping her to breathe more easily by raising the head end of her bed slightly on books and using good old tried and tested Vicks Vaporub (suitable for children aged 2 and over. Always read the label). using appropriate bedding - in the summer time that may be a lightweight sheet to keep cooler, in the winter a children's duvet or in Miss T's case we still like to use 'grobag' style sleeping bags - they come in sizes up to age 10 these days and are a great way of helping keep her at a comfortable temperature knowing that it is not going to slide off the bed and leave her feeling cold. keeping her favourite comforters close to hand (in Miss T's case her two favourite cuddly toys Hoppy & Patch) and making sure we have spares for when they are in the wash! This tip is as much about staying well as getting well. Drinking plenty of water and fluids is important all year round but especially when feeling unwell. Even if that means adding a little squash to water to encourage children to drink more. We tend to cut down on drinking cow's milk when Miss T has a cold as it can leave her feeling more mucusy. Most people know that sugar is not great for dental health and obesity but it is also considered to be an inflammatory food too so generally reducing sugar consumption is definitely a good thing in our family. To help our children eat well we encourage them to think of 'eating a rainbow' everyday. By eating lots of different coloured fruit and veg, I can know that they are getting lots of the nutrients and vitamins that their bodies need to get well and stay well. Eating a 'rainbow' of fruit and veg to stay well! Once again it's not just the kids that need to stay well. When there are bugs and illnesses going around as parents we need to do everything we can to look after ourselves too - reduce stress, eat well, stay hydrated, sleep well, wash hands super well and use hand sanitiser when out and about. Vicks even do a 'First defence nasal spray' for grown-ups and over 12's to help stop a cold from taking hold. 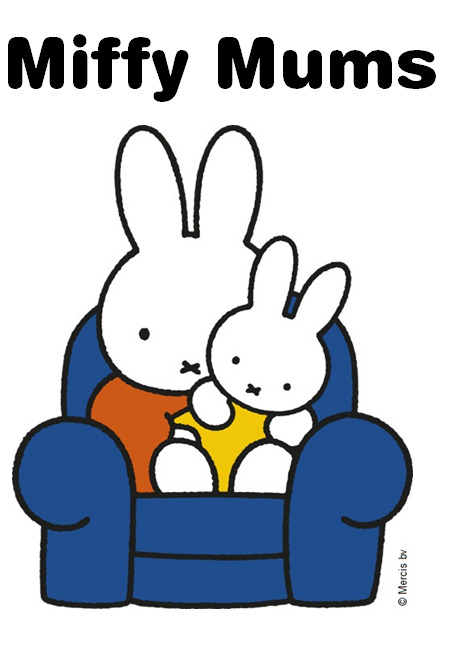 Anything and everything to stay as well as you can to be able to help your kids feel better when they are unwell. Writing this has been a bit of a blast from the past for me as it's brought back memories of childhood times when I was unwell. Vicks Vaporub has been a trusted ally in times of illness for as long as I can remember. I also have memories of daytime TV and being allowed to bring my duvet to the living room and snuggle up on the sofa. And plenty of my mum's soup. Even though these memories are of times of illness, they've become 'happy' memories for me because of the TLC shown by my mum. I hope I can do the same for my kids. Breakfast is probably one of the easiest meals to get 'stuck in a rut' with. Especially for kids - once they've found their favourite (often sugary) cereals, it can be hard to get them to switch to anything else. Add to that the time pressure of having to get everyone fed, dressed and out the house in time for school and sometimes the idea of a quick and healthy breakfast for the kids seems impossible. Over the past year or so, we gradually weaned the kids off all their favourite sugary cereals. Instead the only shop-bought ones I buy these days are the Honey spelt puffs from Rude Health and the Bear Alphabites. Both of these cereals are free of refined sugar, the former sweetened with honey and the latter with coconut blossom nectar. Shredded wheat is also acceptable but as it doesn't have anything to sweeten it the kids tend not to enjoy it so much. They've grown to like porridge, which is great but they've never liked any of the granolas that we've tried before. 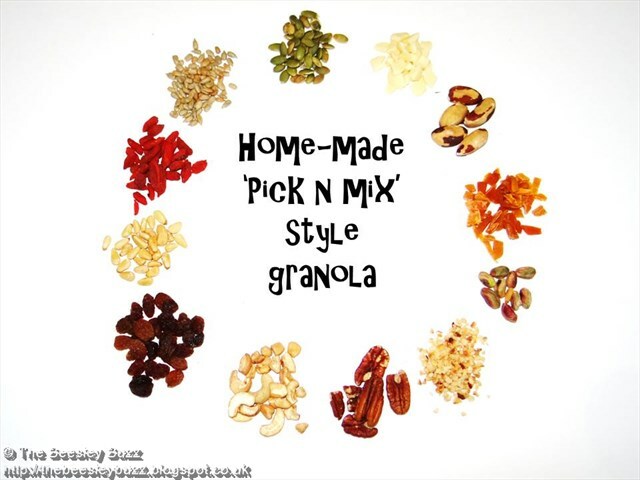 They never even liked my own homemade granola until one day...I decided to prep all the separate elements of it and then allow each child to only add in the extras that they particularly liked and, hey presto, our 'pick n mix' style granola was a success! We've been making it this way ever since and have now found a good mix of ingredients that they all agree on and enjoy so we tend to make a big batch of it once every week or two and that keeps them going. I've learnt the hard way that baking requires specific measurements of the various ingredients but thankfully in other forms of cooking there is more leeway and so this is a recipe where we now guesstimate the quantities and it has served us well doing it this way. 1. Melt together the coconut oil, maple syrup, cinnamon and vanilla powder over a low heat on the hob. Pre-heat the oven to 160C. 2. Combine this mixture together with the oats in a big bowl, stirring well until all the oats are lightly coated. 3. Spread out onto 2 baking trays and cook in the oven for a total of around 40-45 minutes. However you will need to mix it every 10-15 minutes to prevent burning. 4. On a separate baking tray, place any of the nuts and seeds you wish to use. We tend to use pre-roasted hazlenuts so these don't need roasting but the other nuts and seeds do. Bake in the oven for around 5-10 minutes. Keep a close eye on them as they can burn easily - especially smaller things like the sunflower seeds and pumpkin seeds. 5. 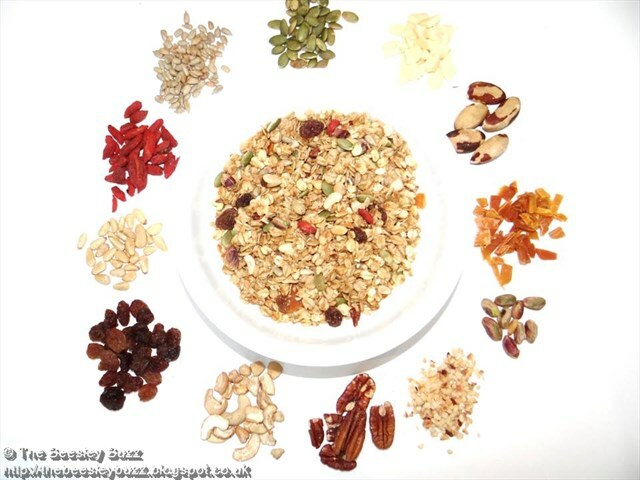 Once the oats and the nuts and seeds are cooked, leave them to cool completely and then mix together. 6. When completely cool, mix in the raisins, mango pieces, goji berries and chocolate. Keep in an air-tight container. The granola never lasts too long in our household but I think it would keep for at least a few weeks in the air-dried container. I love it with Rude Health Almond milk or brown rice milk. It also tastes great with a dollop of yogurt (The Collective Straight Up is great and I also love St Helen's Farm for a goat's milk yogurt). Miss T enjoyed helping me out too so there are lots of little jobs that little hands can help with like mixing, breaking the chocolate pieces and tearing up the mango into small pieces. A (not so) long time ago, in a galaxy (not so) far, far away, Star Wars fan D was sent some fabulous Aquabeads to try out. Not just any Aquabeads but Star Wars themed Aquabeads. In case you're not familiar with them, Aquabeads are small plastic beads which then stick together once water is sprayed on top of them. They come in various 'playset' packs. 'Beginners sets' (with everything you need to get started) and Refill packs are available too. The Star Wars Aquabeads playset comes with a tray to store the beads in (this one is grey and has a star shape made up of the compartments), the 'layout table' that fits over the top of the tray when not it use to secure the unused beads in there, over 1000 beads, templates to make 4 star wars characters and the water squirter. So it was a case of simply sliding in the chosen template. Getting the beads ready in the tray. And get started by placing the right coloured beads onto the correct place on the layout table as guided by the template. The one thing that would have been handy to have in this playset would be the 'bead pen' which is a handy little tool for picking up beads from the tray then releasing them into the correct position on the layout table. D used Miss T's bead pen from her Aquabeads Beginner's Studio set that we already had. Then it was time to spray with water and leave to dry. We've found that sometimes the beads need a second spray of water as occassionally they don't all stick together. Sometimes the shape curves as it dries so may need to be placed under a book or something heavy once dry to help flatten it. In the case of R2D2 the curve actually added to his appeal as it reflected his actual shape! The great thing is that if anything does go wrong and they don't stick together as hoped, the instructions explain that they can be sprayed again and again as necessary with more water. So even if a design breaks, it can be re-sprayed to fix it! The Star Wars Aquabeads playset would make a great gift for both Aquabeads fans and Star Wars fans. It's a great craft activity for kids to do. Whilst the templates are there to help and the colours in a particular themed playset make it perfect for those particular designs, children can also be encouraged to 'freestyle' their own patterns and designs too. 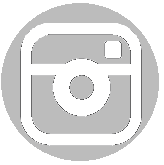 You can find your local Aquabeads stockist and online stockists via the Aquabeads website here. Disclosure: We were sent the Aquabeads Star Wars playset for the purpose of review. All opinions are our own. Our 2016 round-up of the year! Blogging definitely feels like it has taken a back-seat this year as life generally got too busy to try to keep up with blogging about but it also made me realise that that's ok. The blog is here - it's not going anywhere, and there shouldn't be any pressure to write. As the kids are growing older, I'm also facing the dilemma that I have read about countless times...for the sake of their privacy I don't feel I can blog about them in any kind of deep and meaningful way but at the same time they still enjoy looking back on previous blogposts and reminiscing about their adventures. January started sadly for us in 2016 having to say goodbye to our family pet Bella cat. The kids were comforted a little by looking back over photos of Bella and writing up some of our Bella stories as treasured memories. It came as a shock to us all and acted as a stark reminder of how sometimes we can grieve more readily over a pet when we somehow manage to bottle up our grief at other times. February was another month of mixed emotions...Miss T's JIA seemed to turn a corner as we captured in this walking in the woods update. But there was the loss of another family pet. This time Holly dog, granny and grandad's dog who can be seen in our Easter photos from a couple of years ago here. We also enjoyed some family days out together over February half-term. March and April are always busy months with D's birthday and Miss T's birthday. D visited a trampolining centre nearby with a couple of friends for his birthday party and Miss T had a build-a-bear party which she thoroughly enjoyed along with brunch at Bill's restaurant which has become one of our fave places to visit. We had a whirlwind weekend in London in May. Although it was crazy busy, it was actually brilliant that we fitted so much in. In June, our eldest turned 12. He had a fun-filled session of laser combat at Quex park. I also did something for me in June - which never normally happens! I booked onto Henrietta Inman's summer cookery course in London one rainy summer's evening and felt totally out of my comfort zone doing so. Absolutely loved the evening and have been baking non-stop from her 'Clean Cakes' book ever since. And then we were halfway through the year! I realised I'd lost a stone in weight by cutting out most refined sugar, reducing gluten and cutting down on dairy. I was eating more than ever - loads of veg, greens, salads, nuts and nut butters and felt better than I had for a long-time healthwise. Amelia Freer's book 'Eat, Nourish, Glow' was a turning point for me as it explained the reasons why various foods affect our bodies in certain ways - then it all made sense and as I gradually made these changes and felt better for it, it encouraged me to stick to it. I'd increased my arthritis medication to help keep the pain at bay but realised that although I don't enjoy taking such a high dose of medication, it is better to keep the inflammation down to help reduce longer term damage to my joints. So I was starting to see that having less pain because of the increased pain relief was actually a good thing rather than trying to keep the dose down but end up with inflammation and pain. Miss T's JIA continued to have it's ups and downs also as we found out in July. August was AMAZING!!! We still look back at it and wonder whether we dreamt it. We had an overnight stay at LEGOLAND, following soon by a week in Wales. Whilst everyone else was enduring a heat wave Wales was pleasantly warm and thankfully not too wet as we'd experienced in the past. 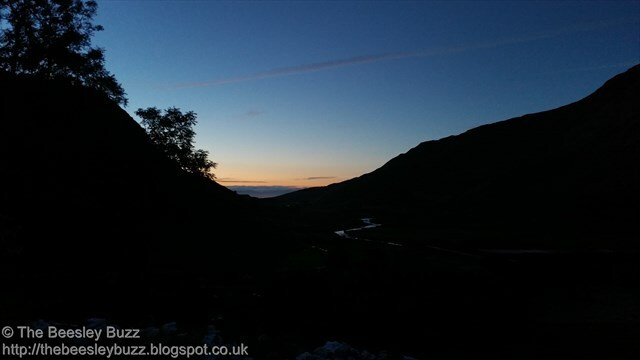 We stayed in an idyllic cottage near the beautiful Lake Ogwen which became a favourite spot to visit. With a hot tub overlooking countryside all around it was a brilliant week of relaxation to prepare us for what was to come just a few days later. Still good stuff, but just totally jammed packed adventures in....Dubai! We kept a daily diary but for me Day 1 was in many ways the most magical. It is somewhere we never dreamt we'd be able to visit and yet now cannot wait to go back. There were so many activities crammed into our stay courtesy of Visit Dubai. We adored every second of it. When the weather is cold here, I find myself day dreaming of being by that pool at the Rove hotel. I think I'd quite happily feel able justify a holiday there just to spend time at that pool and stay at the lovely Rove. Plus another trip to Thiptara at the palace of course. Richard wrote up a really great summary of just how perfect Dubai was which you can read here on Tots100. Then September arrived and we were thrown into the new school year. Miss T started school and settled in brilliantly. I tried to keep up with a bit of GBBO baking whilst trying to stick to some of the clean eating principles of reducing refined sugar and gluten. Our love affair with Pink Lining continued with the Wanderlust rucksack which seemed aptly named given all the adventures it accompanied us on this summer. But I have to admit I was saddened to find out that the Pink Lining brand had been taken over by another company at around this time and things just don't feel the same since! We had another little break, this time just me and Richard with a Wicked Weekend in London. Being the first break away without kids we made the most of it by booking into a macaron cookery class at L'atelier des chefs. OK so the sugar-thing went totally out of the window that weekend but having had several failed attempts at Macarons, I REALLY wanted to know how to make them properly. Talking of breaks, we also experienced the first broken bone in the family. D fell off his bike the day before term started and broke his wrist. Badly. It needed an overnight stay in hospital, general anaesthetic and an operation to re-set it and then several weeks in plaster. 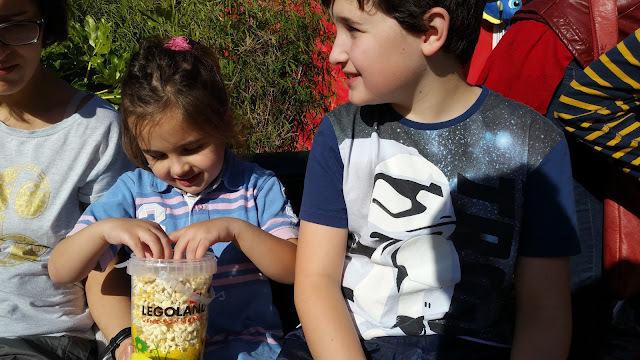 In October, a tumble-dryer transformed our lives and I had a great birthday at LEGOLAND. 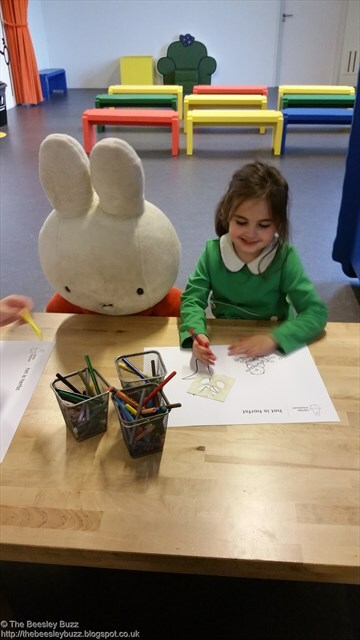 At the very end of October we spent the half-term break in Amsterdam, culminating in our visit to Utrecht to the Miffy museum. A long-awaited bucketlist adventure for us. November and December have been busier than ever, the irony being that there are far fewer blogposts in those months because life has been so hectic. My dad's been unwell all year and he's been particularly poorly at times over recent months. It's not something that makes it onto the blog as he's always preferred his privacy but I guess it represents how blogs are sometimes just one teeny facet of people's lives. Although Christmas has never been my favourite time of year, I do usually get a little sparkle of excitement on New Year's eve at the prospect of a new year and all the adventures that it may hold. This year that spark was missing. As yet, I cannot pinpoint why because in many ways circumstances behind the scenes mean that it could be a very interesting year ahead. In many ways I feel more ready than ever before to tackle challenges, to push open new doors, to continue to reclaim parts of me that have become lost within the title of being 'mother'. Perhaps it is this preparedness and calmness about it that has meant there is no need for the nervous excitement of a new year. It is more of a calm 'bring it on'. Hope that 2017 is a good year for you!